In the event of a power surge, the fuse in the syringe pump may burn out. This means that the syringe pump operation will be unable to continue since the pump is unable to receive power. If this occurs, your Fusion syringe pump will not turn on, and you will need to replace the fuse. Chemyx Fusion Series syringe pumps come with an easily accessible fuse holder that also includes a complimentary backup fuse. Please review the following instructions for accessing the fuse holder, replacing the burned-out fuse, and continuing your syringe pump operation. Disconnect the power cable from the back of the syringe pump and locate the three-prong power plug on the back of the pump. The fuse holder is located directly underneath the power plug. Slide out the fuse holder from the power plug. 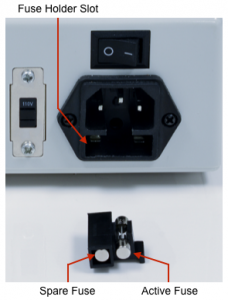 There is a small indentation on the bottom edge of the power plug. A small coin or flathead screwdriver may be needed to remove the fuse holder from the pump. The fuse holder should contain two fuses. The exposed fuse is the active fuse and would be the one to replace in the case of a blown fuse. Remove the burned-out fuse from the active slot in the holder and discard appropriately. Remove the back-up fuse from the plastic casing by using the burned-out fuse (or similar item) to carefully push the backup fuse out of the casing. Place the backup fuse in the active slot. Ensure that the fuse is centered within the active slot. [Optional] Store a brand new fuse (5mm 200mA 250V glass fuse) in the plastic casing to act as a future replacement. Insert the fuse holder under the power socket of the pump. Plug in the power cord and power on the pump to ensure correct installation for smooth syringe pump operation.